CATIA Version 5 Wireframe and Surface allows you to create wireframe construction elements during preliminary design and enrich existing 3D mechanical part design with wireframe and basic surface features. As a complement to CATIA Part Design, this product meets the requirements of solids-based hybrid modeling. The features-based approach offers a productive and intuitive design environment to capture and re-use design methodologies and specifications. As a scalable product, CATIA Version 5 Wireframe and Surface can be used in cooperation with companion products such as CATIA Part Design, CATIA Assembly Design and CATIA Generative Drafting. The widest application portfolio in the industry is also accessible through interoperability with CATIA Solutions Version 4 to enable support of the full product development process from initial concept to product in operation. 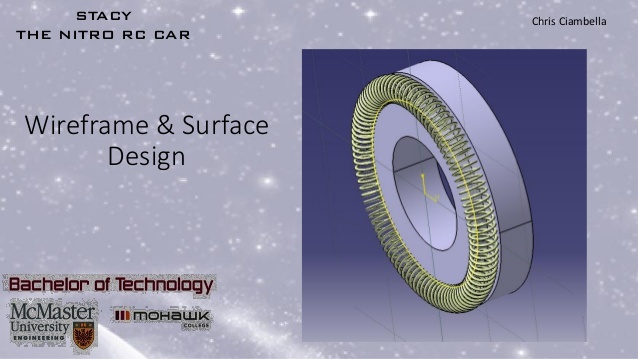 The CATIA Wireframe and Surface User’s Guide has been designed to show you how to create and edit wireframe and surface features as well as hybrid parts. There are often several ways to reach the final result. This guide aims at illustrating these various possibilities.